Diseñado para complacer al paladar de los amantes del vino y el queso, esta sesión de cata de 1.5 horas en Barcelona es una fiesta para los sentidos. Durante su experiencia culinaria, degustará cinco vinos locales y cinco quesos regionales, todos seleccionados para complementarse perfectamente. 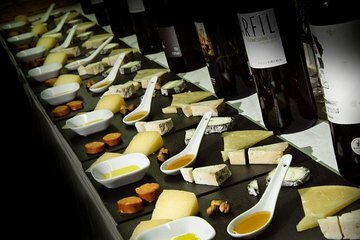 Aprende sobre los procesos de vinificación y las técnicas de degustación con un sumiller profesional y descubre los secretos de la combinación de vino y queso a la perfección. Este tour para grupos pequeños se limita a 12 participantes para mantener un ambiente íntimo. Degustación de vinos y quesos de 1.5 horas en Barcelona. Ideal para los amantes de la comida y el vino. Prueba cinco vinos y cinco quesos, acompañados de pan casero y aceite de oliva. Aprende sobre los procesos de producción y técnicas de degustación locales en una guía de sommelier. Diríjase al emporio del vino, convenientemente ubicado en el histórico distrito de El Born, en Barcelona, y salude a su anfitrión sommelier. Después de tomar asiento, recibirá una descripción general de la escena culinaria de Barcelona: aprenda sobre las diversas regiones vinícolas de Cataluña, descubra los secretos de los procesos de vinificación y mejore su disfrute del vino con técnicas innovadoras de degustación. A lo largo de una hora y media, degustará cinco variedades de vino acompañadas de cinco quesos artesanales. Descubra lo que hace que sea un maridaje perfecto y disfrute del aceite de oliva, el pan recién horneado y la mermelada. Sated, dile adiós a tu guía y continúa explorando Barcelona de forma independiente. Jeremy was great! We learned a lot about Spanish wine and food pairings. We met other travelers from the States and from Germany. Great conversation and new friends!! I loved this tour! I mean it isn’t hard to enjoy cheese and wine. However, the location and presentation was amazing. The tour was so informative and very enjoyable. I think I bought 3 of the 4 wines we had. I’ve done quite a few Viator bookings. This was a great one! Everyman was fabulous!! So knowledgable and informative and so much fun to spend time with!! The wine shop is so cute and we tasted some amazing wine and cheeses!!! We love you Evelyn!! This wine and cheese tasting session was an absolute pleasure the sommelier was highly experienced and provided us with not only the local history and culture of Spanish wine-making, but additional anecdotes, tasting tips and highlights to look out for during the tasting itself. The session was low-pressure, stress-free and there was ample time afterward to get to know your fellow tour group members, leading to a fantastically laid-back social experience. Would definitely recommend to friends and family. Debbie was such a wonderful host! She shared her extensive knowledge of wine with us and we learned of things that we had never considered. We very much enjoyed our time with her and highly recommend the experience!! This was an excellent tasting experience with 5 different wines - generous portions of all, paired beautifully with a variety of cheeses - all of which I would never have had the opportunity of trying before. The presenter was extremely knowledgeable, interactive and a pleasure to chat to and the venue was comfortable and private. I highly recommend this! Extremely wonderful experience! There were three of us and we all loved this tasting. I've been to more than a dozen of various wine'n'cheese tastings all over the world, and this one is one of if not the best one of them. Tastings are frequently either very little informative or heavily overloaded with pro details which makes it a bit uncomfortable for non-experts and not-so-fans of the process. This tasting in Barcelona was just perfect. Debby, our host, selected wonderful wines and provided informative yet extremely friendly presentation explaining both Spanish winemaking and wine selection and tasting techniques. She managed the process of tasting so well that we got all impressions and feelings of wines and pairings - very well selected and generously served. Debby was so knowledgeable and friendly and definitely went the extra mile for us, adjusting selection to our tastes and dedicating more time to us to explain and show and carefully select wines for us to take home. We've got much more than we expected. Great wines, great cheeses, and great time. This was a truly awesome cheese and wine tasting. The pairing of the wine and cheese were truly extraordinary and the best I have ever experienced. The was wine from different regions of Spain and a presentation so you could learn about the uniqueness of each region before you sampled the wines and discussed the different flavors or each wine. If you are looking for a good wine and cheese tasting, this is the tour to take! This wine tasting was very informative!